Our youngest grandson is having a birthday party today. Though his name is Ryder, I call him my little Pop-Tart and he calls me The Boss of Everybody. I mean really, how cute is this kid???? His name has been cut several times on my Silhouette Cameo, then stacked and adhered together as was the yellow offset. 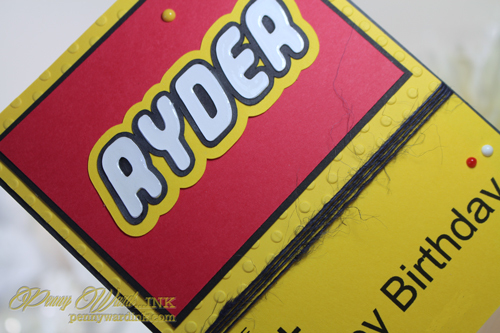 Yellow background is an embossing folder (Polka dots, now will make me think of Lego dots). There is actually more text at the bottom of the card, but for safety reasons, I erased it on the photo. Pretty simple card, yet the colors are so striking. Your grandson is SO COMPLETELY lucky that you made him such an awesome card!! 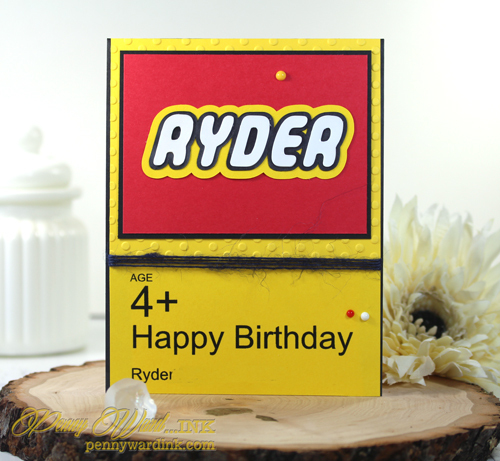 Love that yellow dot background - yes I thought of legos when I saw it!! And I think the nicknames you mentioned are so fun and sweet!! Way to go, Boss of Everybody!! !